Fully revised and updated... and now with ZOOM system for even better orientation! Marco Polo maps feature completely up-to-date, digitally generated mapping. The high quality cartography with distance indicators and scale converters aid route planning. New ZOOM System - all large urban areas are marked on the main map and are cross-referenced to separate inset transit maps which zoom in on the city to aid route planning. We then zoom in further to detailed city maps which can be found easily in the separate index booklet. Includes additional maps of: Bryce Canyon National Park, Death Valley National Park, Grand Canyon National Park, Joshua Tree National Park, Kings Canyon/Sequoia National Park, Yosemite National Park, Zion National Park, Beverly Hills, Las Vegas, Los Angeles, San Francisco. Major sights and key points of interest are marked on the map by numbered stars and these are listed in the index booklet with a brief description to help travellers pick the best places to see en route. Comprehensive index. The map scale is 1: 800 000. 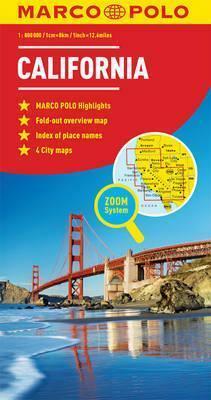 Marco Polo Travel Publishing offers a wide range of high quality cartographic products and travel guides. Marco Polo Guides are known for their handy, compact format and unique Insider Tips. Marco Polo Maps and City Maps are famous for their high quality cartography and additional features like mark-it stickers which help to pinpoint a destination for future reference and aid route planning.